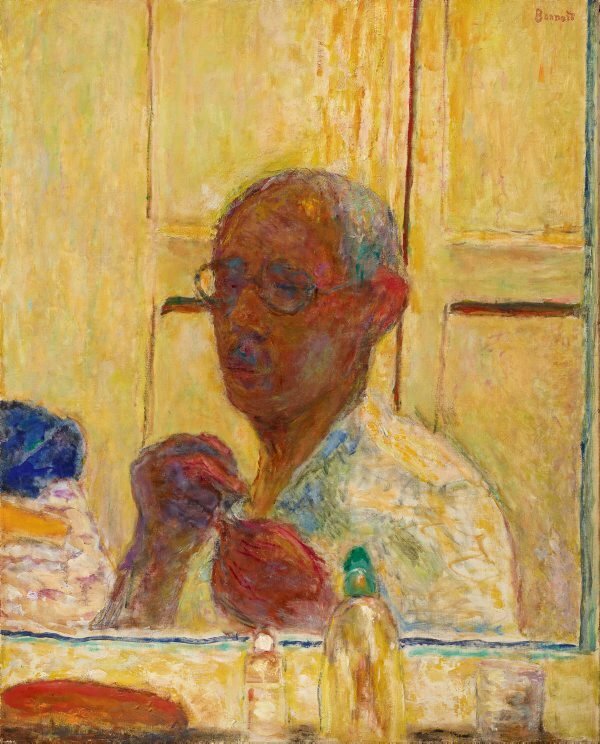 A self-portrait often implies an artist's direct engagement with a mirror, but unlike the Impressionists, Bonnard did not paint directly from the motif, preferring instead to make drawings, sketches and colour notes and then working up his paintings in the studio. He believed that painters capable of tackling the motif directly were very rare, declaring, 'It is not a matter of painting life. It's a matter of giving life to painting'.2 Like Matisse, he used colour and decoration determined the essential qualities of his art. Bonnard admired not only Japanese prints and screens but also Persian and Indian miniatures, capturing something of their iridescent multiplicity in this self-portrait with its brilliant orchestration of near and far views and its vibrant notes of Indian yellow, ultramarine, emerald green, creamy white and deep, reddish purple. With his eyes half closed behind Ghandi-style glasses, Bonnard cups his hands in a curious gesture, recalling his 1931 self-portrait known as 'The boxer' (Private Collection). But in this later self-portrait his raised hands conceal the initial occasion of his painting - a fleeting glimpse of his mirrored reflection quickly jotted down in a spontaneous drawing small enough to fit in the palm of one hand. It was that invisible little notebook drawing which blossomed over time into a poignant, almost painfully vulnerable self-portrait that fused pigment, flesh and atmosphere. Fascinated by the possibilities of mirror reflections, Bonnard exploits them for their tantalizingly oblique glimpses into his private realm. In this self-portrait his pulpy, dark-skinned flesh, severed by the mirror's edge and transfixed by a harsh electric light, is squeezed into the narrow space behind the mirror's reflective surface. Our gaze is thence deflected by myriad smaller reflections and by the eyeglasses that mask his modest gaze. 1. Terrasse called this 'an internal examination of self' which showed an artist who 'lived at a remove from the world, sacrificing all to the passion for art' see Antoine Terrasse, 'Bonnard: The Colour of Daily Life', trans. Laurel Hirsch, Thames and Hudson, London 2000, p.108. Signed u.r., brown oil "Bonnard". Not dated. Wildenstein & Co., 1963-1972, New York/New York/United States of America, Purchased by the AGNSW from Wildenstein & Co. 1972.